The river as a metaphor. We are a cell in the river of humanity. Four Public Art works by Ketti Kupper anchor the entry experience at this pocket park designed and built by North East Trees. 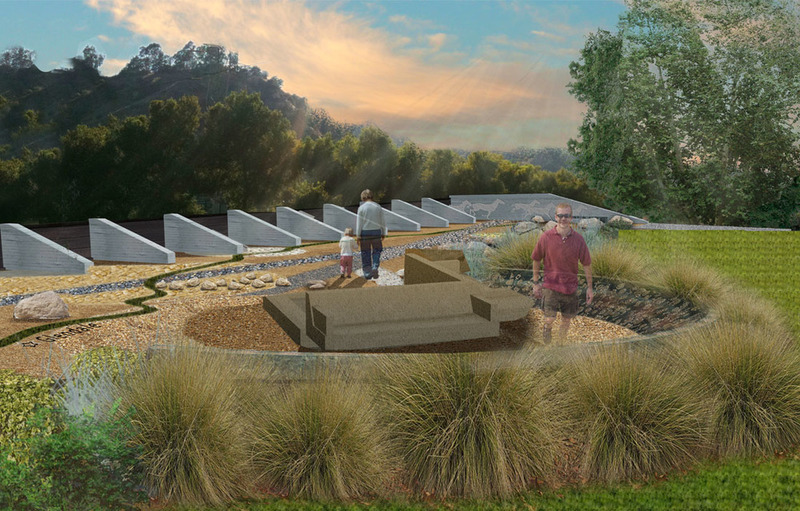 1.“The Circle of Reflection;” a medicine wheel made of boulders with two rectangular seats situated at the vortex of the great Santa Paula drain have the phrase, ‘We are still here’ by the Native American Tongva Tribe is embedded into the seat tops. 3.“Egret’s Flight” depicts a stop animation of a bird taking flight along the wings of the spillway; a symbol of the rich animal life in the river below and a nod to the animation studios of Dreamworks and Disney whose rear parking lots abut to the park. 4.“Artifact Wall” reflects the silhouette of adjacent San Gabriel Mountain range. It’s embedded with items donated from the community as random mementoes to mark our place in time, and as a reminder that our own lives are short and fleeting relative to the river and the mountains. The river and humankind has learned to live life entwined in the architecture of concrete infrastructure. Major thoroughfares for transportation weave in and around the park at the Glendale Narrows and yet we each pulsate with life-giving properties. Every day of our lives new questions surface about what course we will take and how it might impact tomorrow. We seek a path to balance, wisdom and understanding.